Regardless of your age or condition, we strive to optimize your spine and nervous system so you can function at your full potential. We’ve been delivering quality chiropractic care to Osceola and the Michiana community since 1991. Our Goal and Vision is Simple…”to take every patient, every day, one step closer to optimal health.” We’re a one-stop care center offering the best care for you. If we can’t help you, we’ll send you to someone who can! Your chiropractic care plan will involve the most technologically advanced techniques and equipment to ensure that all possible solutions are available to you. Dr. Warren regularly attends continuing education seminars and conferences to learn the latest in chiropractic and physical therapy care so he can deliver the best health to his patients. Our office sees patients of a variety of ages and conditions. From infants to elderly and from routine wellness adjustments to those in severe pain, we’re here to help you. We’ll help your body heal itself and correct your spine on a more permanent basis to restore you back to your optimum lifestyle. 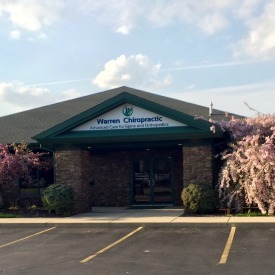 “The best part of chiropractic for me is when I see patients who’ve exhausted all other health care options, finally find relief.” At Warren Chiropractic Center, we focus on treating the whole person, not just your symptoms. Experience advanced healthcare. Call today (574) 679-0100.